Comics Gold Rush in Stevenage! 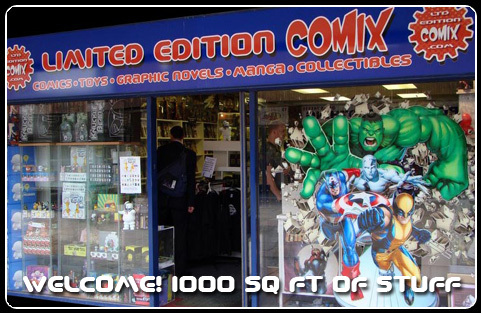 My local comic shop, Stevenage’s LIMITED EDITION COMIX – run by the very genial Rich Emms – has alerted me to their acquisition of a major private collection of some 10, 000 issues published from the early 1960’s to mid 1990’s. The collection also promises key first issues of a large array of Marvel legends. In addition to that Comics gold, there’s much, much more, including: complete sets of Alan Moore’s Miracleman, Watchmen, Swamp Thing, Promethea and a first printing of The Killing Joke. Also, complete runs of Neil Gaiman’s Sandman, Garth Ennis’ Preacher, Frank Miller’s Sin City and The Dark Knight Returns, EVERY Aliens vs Predator comic and a full set of Interview With A Vampire. And that’s clearly the tip of the iceberg.